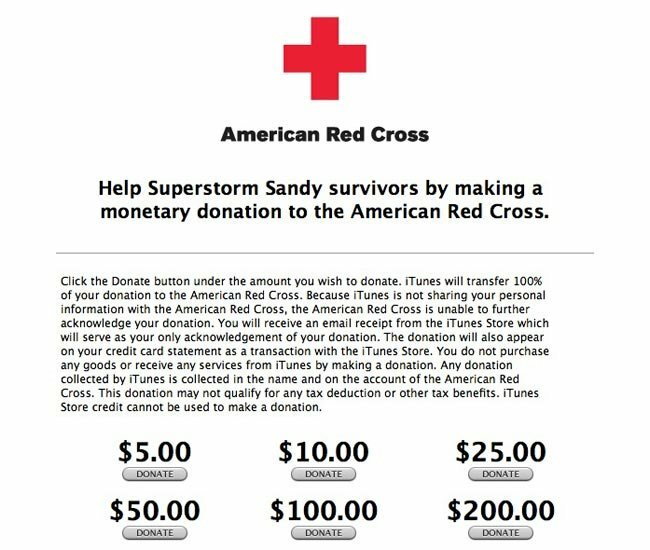 Apple has set up a new page on its iTunes store that allows you to make a donation to the American red Cross, towards the relief effort for hurricane Sandy and the donation page is available through the desktop version of Apple’s iTunes Store. The donation page is also available through the app sore app on Apple’s iOS and you can make donations of $5, $10, $25, $50, $100 and $200, and 100 percent of all donations will go directly to the Red Cross. Apple has done this in the past with similar disasters which include the Japanese Earthquake and tsunami, as well as the haitian earthquakes, you can find out more details over at iTunes.